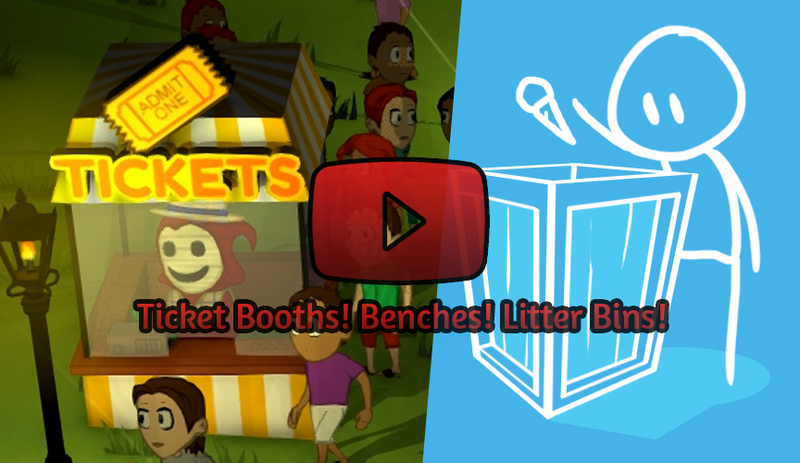 The Eldritch Zookeeper - Ticket Booths! Benches! Litter Bins! 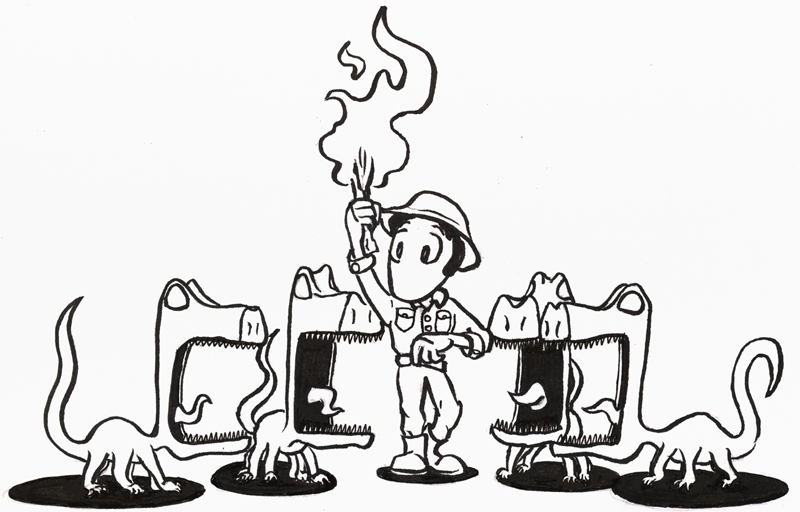 TIGSource Forums Community DevLogs The Eldritch Zookeeper - Ticket Booths! Benches! Litter Bins! 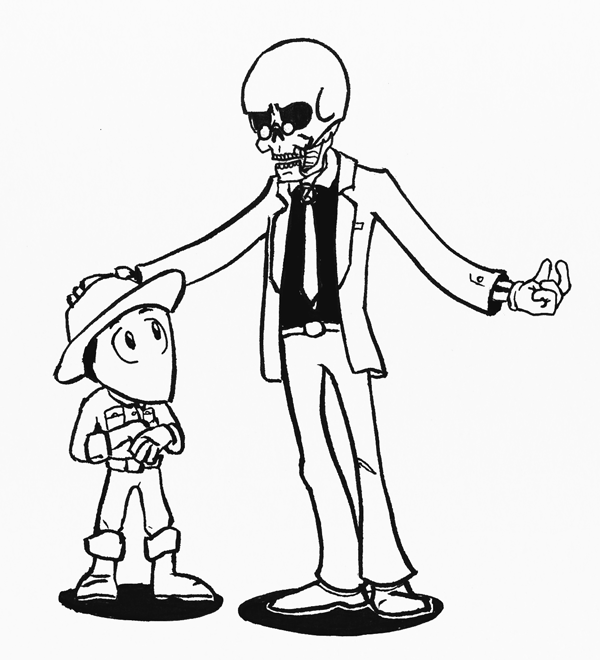 The Eldritch Zookeeper is a game where a deeply unfortunate zookeeper is cursed to run a zoo of inter-dimensional monsters. Think Zoo Tycoon, but with more creatures breaking out of their pens to devour the visitors. Every day, a portal opens to a world beyond sanity, and out drops a crate, containing some dreadful cosmic horror that our hapless zookeeper must 'take care of' (not be eaten by). 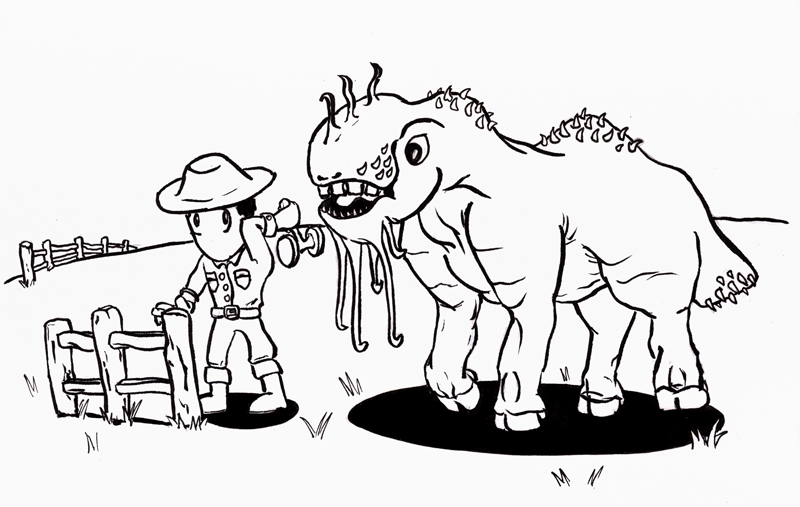 Build fences, fill your pens with beasts from the void, and try and keep them fed and happy. Or else. The game mechanics are based entirely around that the fragility of the physics-based simulation. The monsters get agitated or angry for many reasons; hunger, loneliness, being placed next to creatures they don't like, being set on fire, etc, and keeping the occupants of the zoo more-or-less pacified is a difficult task. And every in-game day this grows harder and harder, as more monsters exit the portal that have to be... 'managed'. This is the earliest I've ever talked publicly about a game of mine. My previous game, The Cat Machine, got a devblog here when it was about 50% done. One of the things I learnt from that was that I've really got to overcome my aversion to showing off my work 'before it is ready'. An indie developer can never afford to keep their mouth shut about their projects, and I'm sure this is something I can do better. So, to kick things off, here's some screenshots of a game that's only had a few weeks work done. This is obvious, but all the artwork is placeholder! 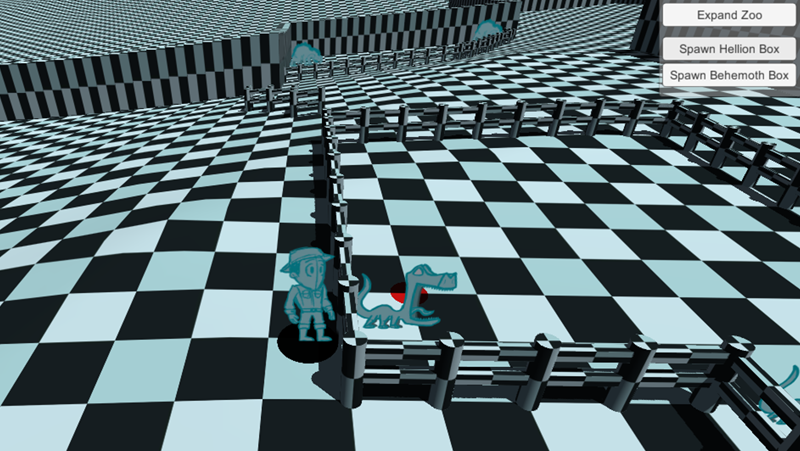 Hooray for checkerboard patterns, five minute sketches in Photoshop, and the default Unity camera background blue colour! ^ A couple of test monsters in some pens. Nothing is animated, so they are just planes rigidly moving about, flipping horizontally. 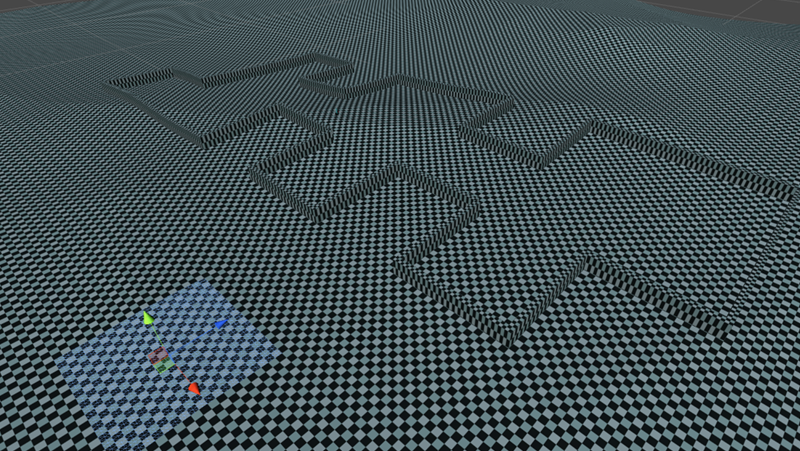 The terrain is a procedurally generated mesh, a few noise functions, nothing fancy. The big red dot is a marker to show the player where they're about to build a fence. ^ Also added a description of the zoo boundaries, as indicated by the walls. My current idea is that as the game goes on, and the player gains more and more monsters to take care of, the zoo randomly expands in different directions. This will need some play-testing, but the direction I'm heading in is to get as many random elements to mix up the player experience as I can. ^ The first gif! Building a fence. I'm going with a drag-and-drop type model, where the fence posts are all instantly built on confirmation. Feels quick. I am also experimenting in this gif with world generation that has far more pronounced hills. Not sure I like it, I think it works better being a bit more subtle. We'll see. The devlog begins! I am also tweeting about the game. 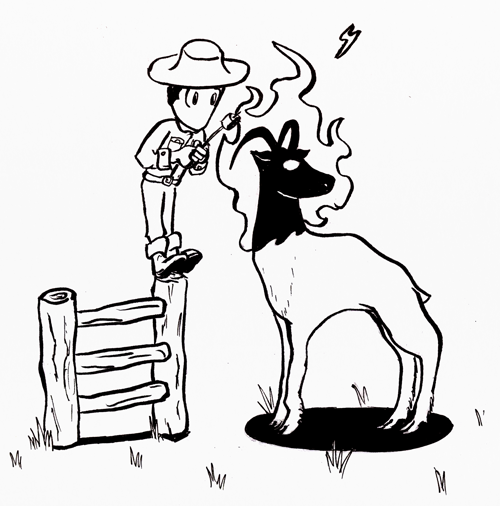 Re: The Eldritch Zookeeper - Run a cursed zoo, badly. Interesting concept. Perhaps a more top-down perspective would be more suitable for this genre though? Perhaps a more top-down perspective would be more suitable for this genre though? I don't even know what genre the game is! I'm still working things out, so yes, I doubt the camera position is final, but I also don't think there are hard-and-fast rules dictating where it should be. I think there needs to be more gameplay sketched in to see what works and what doesn't. The joys of prototyping. ^ I like these concepts, creatures I'm currently calling 'Hellions'. They're not overtly threatening, or menacing, but rather they just stare, white-eyed, unblinking, mouth gaping open. You don't want to anger them (because: teeth) but there is something bothersome about their intensity. ^ This one appears far more friendly, or at least curious. Docile most of the time, but perhaps has some capacity for chaos if startled, or panicked. It would be cool if you had to do increasingly dark things to keep your creatures satisfied and sated. Maybe a creature requires a weekly sacrifice of visitors to an Elder God. Maybe you need to collect expensive artifacts or runes to keep another calm, eating into your budget. Hey, nice to see you back on TIG post Cat Machine. Cool spin on the genre, and awesome to see you're starting the devlog process so much earlier! That's awesome. Best of luck on this project, will be following! I like the idea a lot! Already looking forward to when you implement the "animals" causing harm on the visitors. I wonder how the player will cover that up so that visitors still keep coming. Will there be a lot of fence-upgrades as well, and more importantly, will the player be able to house the great Cthulhu? This is a great idea, so much potential! It'd be cool if you had to summon the creatures or something, finding special guests which help out creating portals or w/e. Will definitely be following this one, good luck! Wow this looks great! So far the art style reminds me a little of don't starve. Which is certainly a good thing I think. And I think its a really cool idea for a game. So its gunna be like a tycoon, zoo-builder? Hey, nice to see you back on TIG post Cat Machine. Cool spin on the genre, and awesome to see you're starting the devlog process so much earlier! There'll certainly be different grades of fence, some better for certain creatures, at the same time as being worse for others. I think it'll resemble Don't Starve in a few ways, mainly because my art style is most comfortable with outlines of variable thickness. Also, the 2D planes for characters. At the same time I think the various actors will more obviously dwell within three dimensional space, so the depth of the scene will be very different, and also the simulation will be more physics-dependant than animation-dependant. But, Don't Starve is a very complementary comparison! I should really buy that game to check it out, it looks great. And yes, a zoo-building game. I don't know how 'tycoon-ish' it'll end up being, I tend to think of the original Roller-coaster Tycoon, or the Bullfrog games, and it'll be a long way from those. There'll certainly be more death involved. And now for today's updates. Firstly, here's a gif of an angry creature. Don't worry, there are fences to sto... oh. Okay. ^ The fence posts and crossbeams are all physics objects, and when an angry creature stampedes through them they either break completely, or only half-break, and swing on their hinges. It's all rough right now, clearly the way the monster moves is extremely dumb, it currently picks a direction and sticks at it. Also, the 'explosion' values could need some tweaking, it's all very intense and harsh, I'd like to soften the break a little, while still seeing fence elements tumble all over the map. 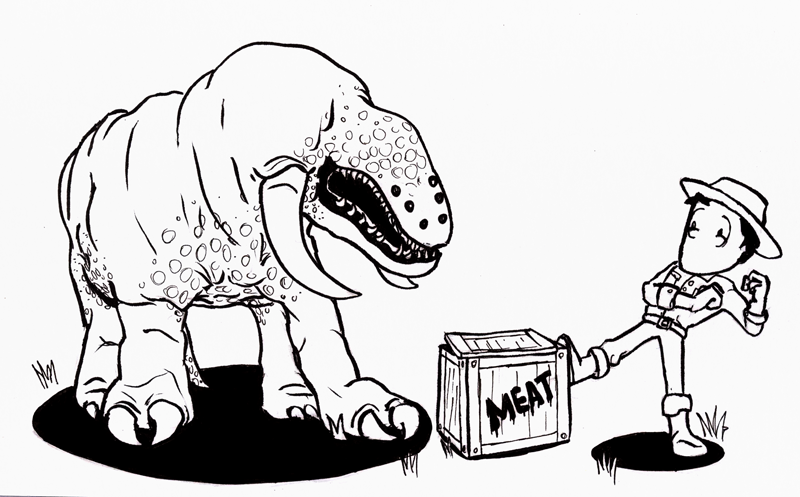 ^ "please choose the box to eat please choose the box please"
This monster, which I'm calling a Behemoth right now, is I think the most brutal creature, with a disposition that's aggressive and brooding on a good day. There's something disconcerting about having a huge creature, with significant muscle-mass... and multiple tiny eyes. 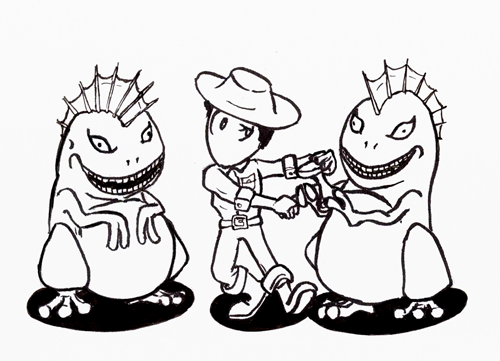 ^ These creatures are a bit more creepy, and amphibian, but mischievous rather than violent. I think they'll always be ready to cause some trouble, but they'll mainly be a pain, allowing the more vicious creatures to get away with murder. ^ Not a super-interesting screenshot, but the terrain object was all one mesh. Now using multiple meshes streamed from the same procedural data, so the levels can be much larger, since performance is now acceptable. A deer-like creature whose head is wreathed in flame. It's the beast with the lowest cosmic-horror factor, and for the most part they'll be very peaceful. However, they will be easily startled, and what's worse than a stampeding herd of animals? A stampeding herd of animals who are on fire. Alright! This game looks awesome. 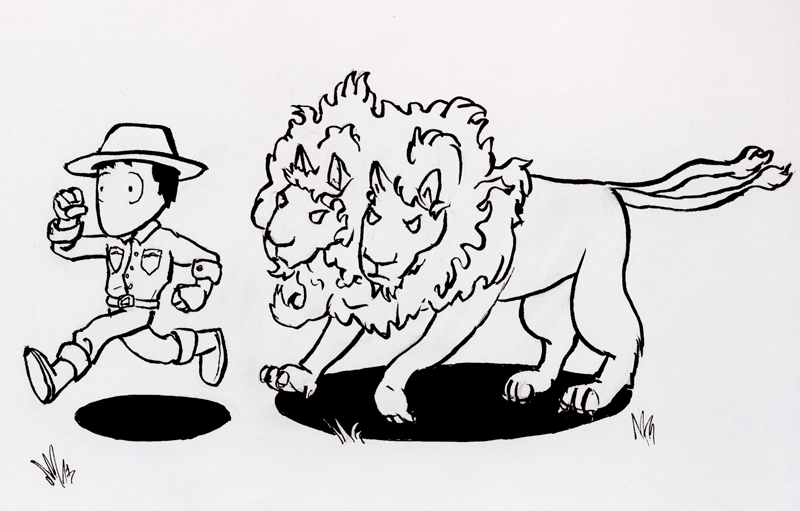 I love the idea of you being a zookeeper and having monsters instead of regular animals. Awesome work so far man, keep it up! ^ This one is probably the ink rendering I'm least happy with, but oh well, scratchy concepts are still concepts, and I'll post it here regardless. I'm also less sure about this monster idea, I really like the conceit of some sort of lion/Cerberus hybrid, but aside from a great focus on hunting, I'm not certain it adds a great deal to the mechanics, nor the interplay between the species of creatures. It's also the least cosmic-horror-y, so I expect this concept to change a great deal before it gets in the game. But that's okay! That's why I've doodled all these to begin with. Some neat stuff here! I'm into this concept. Maybe a weird detail to focus on, but I really like that you've put in slopes/hills from the beginning. They add some nice character to the landscape. Are you planning on there being any gameplay implications to slopes or is it just gonna be a nice cosmetic touch? The idea is really neat, I really dig that artwork. Are you thinking about using 2D sprites/skeletal animations or will you use 3D models for your characters? PS: the placeholder texture must really hurt your brain while seeing it for hours XD. Are you planning on there being any gameplay implications to slopes or is it just gonna be a nice cosmetic touch? No plans for slopes right at the moment! As it's all physics-based, it's far more interesting than a flat plane, especially when the fences get broken and roll down hills. Yes, I think the checkerboard has destroyed my eyes. Oh well! 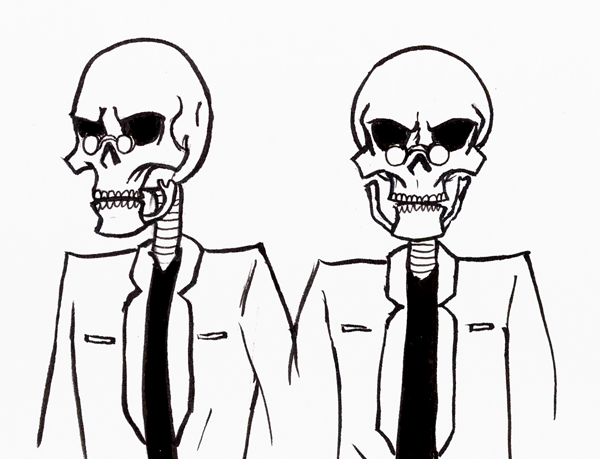 Playing with the idea of a sharply dressed skeleton as the antagonist, acting as the puppet master of the cursed zoo situation. He's in charge of 'Human Resources'... interpret that as you will. I think that's it for this current stage of concepts (and also for inktober this year), doing any more would be going too far, I need to bring development forward so I can figure out whether I'm heading down the right track or not. Let's see! 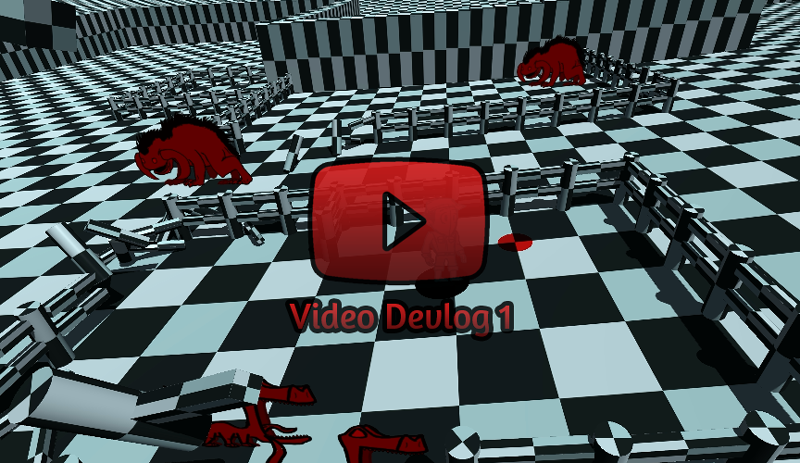 I've done a video devlog! Have a watch. 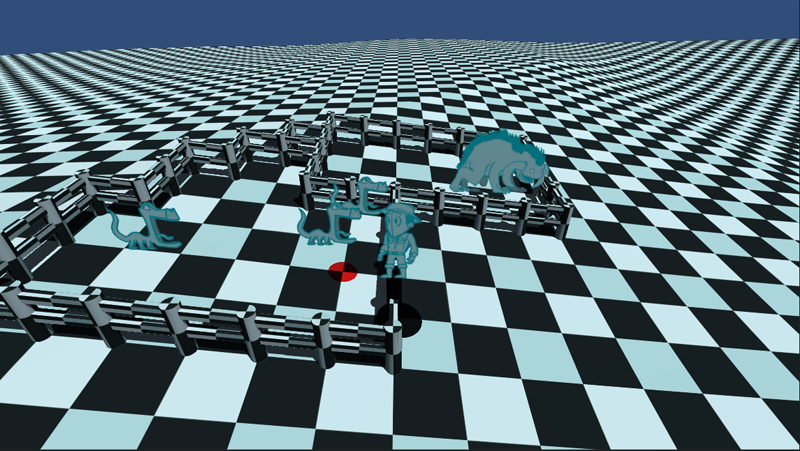 It shows the game in motion, fences built and destroyed, angry monsters, all very early stuff. loving the concepts. Is it going to be a full 3D at some point or more like Don't Starve? Those broken fence posts hanging and swaying off the still-standing parts of the fence are really great. Obviously it's early in dev, so I dunno if you've thought about this yet or just want to experiment with options, but are you planning on there being a way for the players to know what monster is in each box before they open it? Like, would the strategy be to build a central container pen for the sole purpose of opening boxes and herding the resulting monsters into the appropriate enclosure, or will it be easy to tell what's inside so you can just go to the correct pen before opening?